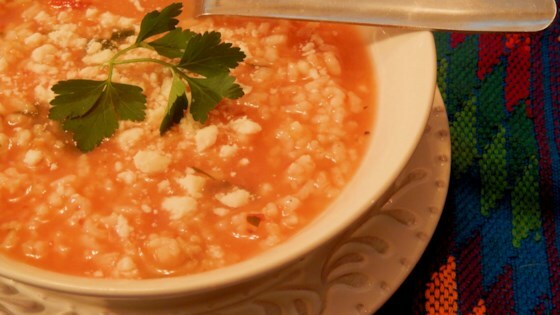 "This simple Mexican rice soup takes a chicken broth base and adds roasted tomatoes, garlic, and onion, all topped with fresh parsley and Cotija." Bring water to a boil in a pot. Add rice, reduce heat to low, and cover with a lid. Simmer until rice is nearly tender, about 15 minutes. Heat a skillet over medium heat. Add tomatoes and roast until evenly charred, 5 to 7 minutes. Remove skin and transfer to a blender. Add onion, garlic, and bouillon. Process tomato mixture until smooth. Heat oil in a small saucepan over medium heat. Pour tomato mixture into hot oil; cook and stir until flavors incorporate, 3 to 5 minutes. Add to the saucepan with the rice. Season with salt and cover with a lid. Continue cooking over low heat until rice is soft, 7 to 10 minutes more. Remove from heat. Sprinkle Cotija cheese and parsley on top, cover with a lid, and let sit 10 minutes before serving.